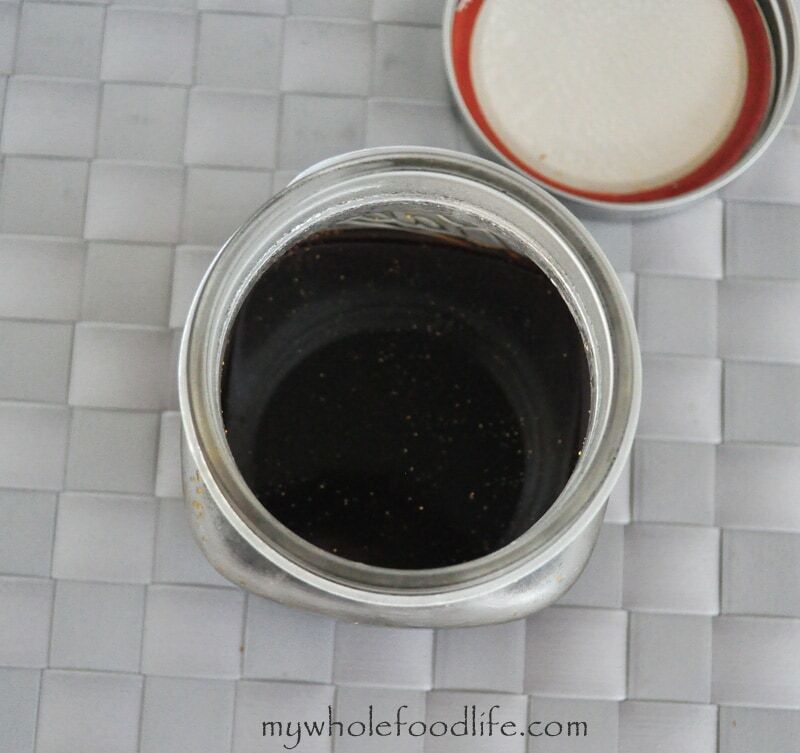 Easy Teriyaki Sauce with no refined sugar! I am a big fan of creating recipes for things I would have bought in the store. This homemade teriyaki sauce is one of those things. I have made homemade ketchup, homemade salad dressings and homemade tomato sauce. Teriyaki sauce is another to add to the list. Have you looked at your store bought teriyaki sauce? Most of them are loaded with highly refined sweeteners like high fructose corn syrup. My homemade teriyaki sauce recipe is made of just a handful of real ingredients and no processed sugars! Keep in mind, since there is less sugar, it will not be as sweet as store bought sauce. I promise it is delicious though! In addition to the sauce, I wanted to test it out in a dish as well. So I made an additional recipe. 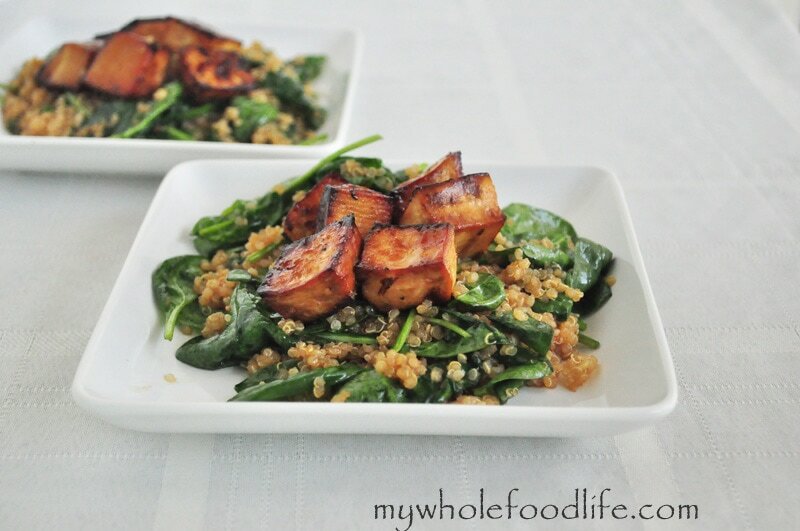 It’s a teriyaki glazed tofu recipe. I like to store this homemade vegan teriyaki sauce in mason jars. In a sauce pan , mix all the ingredients on low heat for about 5-7 minutes. Cut the tofu in cubes and place into a container. Pour the teriyaki mixture into the container and let it marinate for at least an hour. When it’s done marinating, use a slotted spoon to scoop up the tofu and lay it on a lined baking sheet . Bake for about 35-45 minutes, stopping halfway through to flip and brush more sauce on the tofu. Once the tofu is done, set it aside. In a large saucepan , heat the cooked quinoa with the remaining sauce. Turn down, cover and simmer for about 5-7 minutes. Lastly add the spinach and cook just until it is slightly wilted. Uncover and let the remaining sauce boil off. Top with the roasted tofu. Enjoy! The mixture will thicken slightly in the fridge. When ready to use, you can try the quinoa dish. If tofu isn’t your thing, feel free to use your favorite protein. Thanks for the inspiration- first time I followed your instructions accurately and the sauce was way too salty for us (I used Kikkoman soy sauce), this time I subbed part of the soy sauce with light chicken broth for chicken teriyaki and it turned out great. Used also a little bit more arrowroot, so it would thicken nicely. Great idea to use maple syrup! Are the ginger and garlic supposed to be fresh or powdered? I'd like to know what I could substitute for for maple syrup (it's hard to get and very expensive ) - could i use soaked and blended raisin or date sauce? Or how about molasses? Do you think the taste difference would be too noticeable ? Molasses may effect the flavor, but a date paste should work great!